A collection of images featuring iconic buildings and other beautiful structures across Canada, South Africa and the United Kingdom. 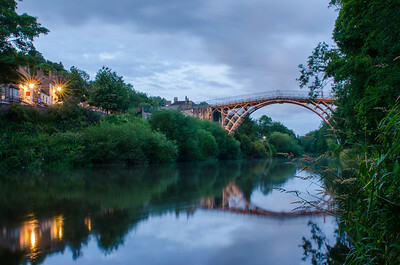 The settlement of Ironbridge is celebrated as a symbol of the dawn of the industrial age, the technique of smelting iron with coke being perfected close by. The Iron Bridge (1780), from which the settlement takes its name, was the first of its kind built from cast iron. Shropshire, England. Build between 1840 and 1870, the Palace pf Westminster is the meeting place of the House of Commons and the House of Lords, the UK’s two houses of the Parliament. Westminster Bridge, designed by the Swiss architect Charles Labelye, was built earlier, between 1739 and 1750. City of Westminster, London, England. The Hisense Wheel of Excellence framed through a window of an old dockside warehouse. The giant 163 ft. ferris wheel stands at the entrance to Cape Town's Victoria and Alfred Waterfront. Cape Town, Western Cape, South Africa. 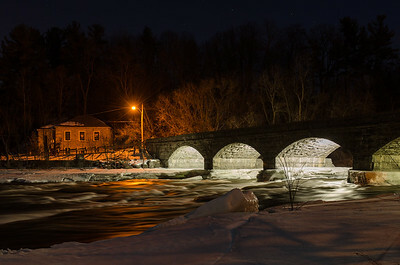 Winter ice melts around an old stone bridge over the Mississippi River at Packenham. Lanark County, Ontario, Canada. Meech Creek cascades around the abandoned mill of prominent Canadian inventor and entrepreneur, Thomas L. Willson (1860-1915). Here Wilson experimented with the condensing of phosphoric acid in an ill-fated busies venture to manufacture fertilisers. Gatineau Provincial Park, Quebec, Canada. Construction lights and scaffolding add an aesthetic quality during restoration of Parliament Hill's West Block. Ottawa, Ontario, Canada. Lights of the Fairmont Chateau Laurier Hotel add their colour to the locks beneath, Rideau Canal, Ottawa, Ontario. The Royal Alexandra Interprovincial Bridge (1900) spans the Ottawa River. Constructed by the Canadian Pacific Railway to provide rail connections throughout Ontario and Quebec, the historic steel truss cantilever bridge now provides an important local commuter link between Ottawa and Gatineau. Ottawa, Ontario, Canada. Nepean Point provides spectacular views of the Ottawa Skyline. Ottawa, Ontario, Canada. Canada Day celebrations in the Capital draw to a close with a dramatic firework display over Parliament Hill. Ottawa, Ontario, Canada.